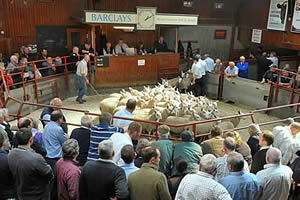 The Cumberland & Dumfriesshire Farmers Mart had forward 6,246 Store Lambs (including 1,811 Hill Cheviots) at their Weekly Sale at Longtown on Tuesday 15th November, 2011. Another excellent show, more distant buyers present, trade the dearest of the season. Top of £74.50 for Texels from Ridley Stokoe, Bushfield and Shieldhill; Charollais £73.50 Clarghyll, £70 Broomhouse; Beltex £72.50 Romanway and Greenside; Suffolk £72.50 Mains and Branxholmbraes; Greyface £72 Allensgreen; Cheviot Mule £71 Priesthaugh; North Country Cheviot £69.50 Alnham Castlehill; Romney Marsh £66.50 Holme Farm; Blackface £65.50 Linton House, £64.50 Horseholme, £61.50 Halterburnhead; Herdwick £58.50 Derwent House; Swaledale £49, £48.50 Greenleycleugh. Hill Cheviots (1,811) were another fine show, all classes the best trade of the season. Top of £66 Girnwood, £65.50 Unthank, £64.50 Meikledale and Routinlynn. Cast ewes to £90 Lochguise and Linton House, hill ewes to £70 for Blackface from Allensgreen. Breeding sheep to £81 for correct Texels from Lochguise; Hill Cheviots £73 Lochguise; Blackface £69 Alnham Castlehill; Swaledale £61 Low Green Ends.